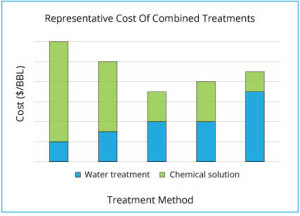 Although water treatment is a known process, there still lacks an efficient one-stop solution which addresses all the above impurities in a cost-effective way. PRRO Water bridges that gap and provides a holistic solution by utilizing the innovative physical and mechanical technologies in combination with chemical solution. One such technology is the Hydro-Pod technology. The synergistic treatment effect of the unique combination of water treatment technologies in the Hydro-pod provides a one-stop solution for all kinds of waste water such as produced and flow back water, industrial waste water, etc. The flexibility and compatibility of Hydro-Pod technology to plug in at different stages of the treatment process has made the desalination process much more efficient and cost effective. Hydro-Pod treated water has been reused for oil field and applications and agricultural purposes.